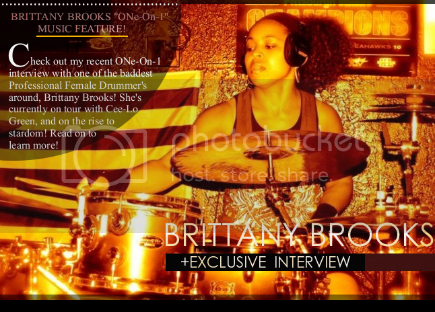 I had the honor of chatting with one of the baddest female drummers in the biz, Brittany Brooks! She’s performed with artist’s such as Anitra, Raz-B (of B2K), CrazeDotCom, USII, Airick Arquse and is currently on tour with Cee-Lo Green! Needless to say, she’s a very busy woman, but she managed to take time out of her busy schedule to grant me a One-On-1 Exclusive Interview! Click “Read More” to check it out! I’ve been playing drums for 13 years now. Wow, that’s a long time! At what point did you discover your passion, and realize that playing the drums was what you wanted to do professionally? I knew the drums were my passion when I made the decision to move to southern California to build my music career, and to make a living at it. I know you’re from the Bay Area, so you moved a few hours away from your hometown to go to LA, right? Was your family supportive of your decision? Yes! My family is and has always been 100 percent supportive of my dreams, whether it was music, school, work, or just life in general. I can always count on my family to be there. That’s really awesome Brittany. So, this is a question I like to ask all Artists, what is music to you? What do you want your music to do for others? Music is universal and it has the power to communicate to anyone and everyone. It heals and it comforts. Music inspires me to push harder. I can’t really explain it but it motivates me to get back on track when I’m distracted. And I want my music to do the same for others. Inspire and motivate! That’s a great answer! Music has a lot of power, which is why it’s important to make it positive. Who are some of your biggest musical influences? I have been a huge Whitney Houston fan for practically my whole life! I also LOVE Alicia Keys!! 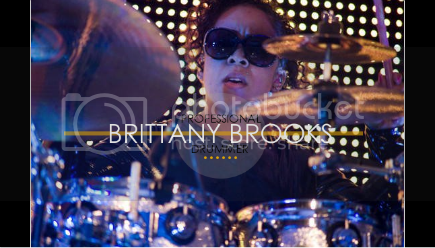 But as far as drummers, Aaron Spears (drummer for Usher), Margis Miles (Mulatto, Nas, Keri Hilson) and Sheila E. would be my greatest influences! Wow, such amazing Artists! So, besides them, who would you like to play for in the future? I would love to be on a pop rock gig like, P!nk, Jordin Sparks or Lady Gaga but It would be a dream come true if I ever got to play drums for Alicia Keys!!! It will definitely happen for you Brittany! Now, I like to ask this question to every believer that I interview. What role does God or Christianity as a whole, play in your life, and your music? Christianity plays a major role in my life. At my church, “Hopes House Christian Ministries,” I’ve learned that it’s not about religion, it’s about relationships. I have a relationship with Jesus Christ and seek His will and guidance for my life over my own will. As far as within my music career, if I have an iffy feeling about a project, it’s usually God telling me "no" lol! Lol! That’s an awesome method! So, as we get to the close of this interview Brittany, tell me, what other ambitions do you have? I would like to learn how to play the piano and bass guitar and start producing music. And someday I would like to start my own production company. So, you have some big plans ahead of you! I’ll definitely be on the lookout for all of your up and coming projects! And finally, what has been your biggest moment thus far? When I was a teenager I was asked to the stage to play with Sheila E's family band during their show. I played on Sheila E.'s drum set; she was standing right behind me. Another pretty big moment for me was getting my first "big" gig and playing on my first national TV show, Jay Leno! Wow, Congratulations on all of your success Brittany! It’s been great talking to you, and I look forward to following your career! Stay tuned for updates on Brittany Brooks everyone! God’s blessings and much success to you Ms. Brooks! Everyone be sure to keep up with Brittany on all of her Social Networks!